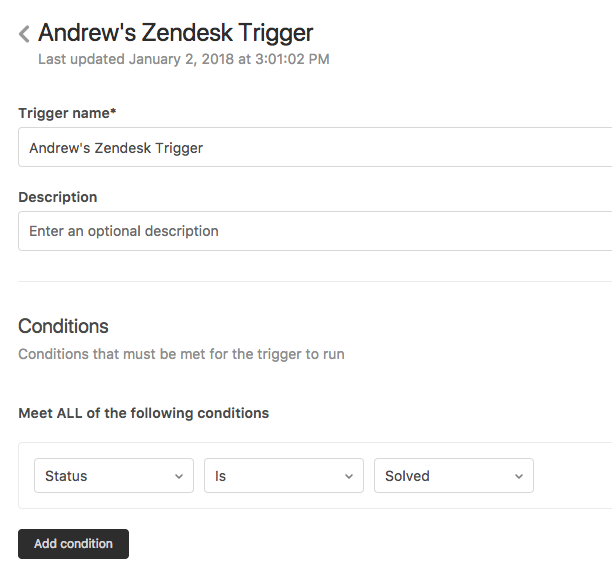 We have created a function that allows you, within Zendesk, to create a trigger that will automatically send an email when the case reaches a certain stage. Messages triggered by Zendesk will obey your contact rules. First thing is to log into your AskNicely account > Cog Wheel > Integrations > Zendesk in order to get the below information, which you'll need for the trigger. Log into Zendesk > Settings > Extensions > Add Target > URL Target. 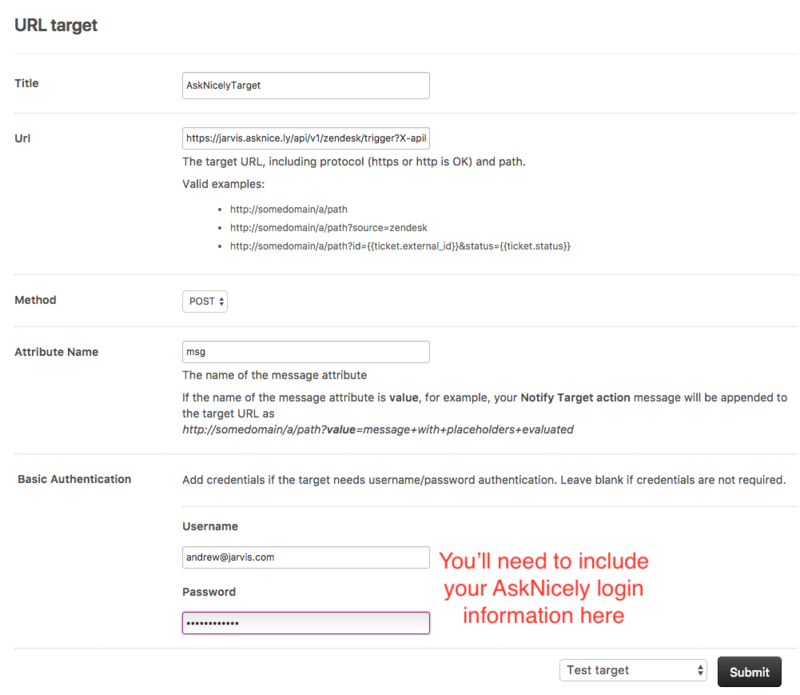 Then include the information from your AskNicely page into the target, as seen below. Heading back to your AskNicely account (which you should just keep open in a separate tab) and click on the People tab, you'll notice this individual making an appearance. That is showing you that the URL Target is working! Create the trigger name (you can vary the name based on the criteria you want and/or the segment name you create to go with it - more on this later) and enter a description if you'd like. Conditions should be set up to how you utilize Zendesk, in this example it is set to trigger when a ticket status is solved. Lastly we'll set up the Notifications: Copy just as seen, but connect it to the target you need to (aka if you set up different targets based on different segments and criteria you've set up). As mentioned above, you can add to or edit the coding to include information that you want to bring over to AskNicely. segment=zendesk - this is the Segment name that will be created when they are imported into AskNicely. You can change this to be a different segment name if you want to create different templates based on different criteria. One example could be sending different templates based on the Type of ticket is created in Zendesk (i.e. Question, incident, Problem, Task). Below is what you would need to add in addition to all the normal information discussed above. Go into AskNIcely and create a new template that would cater to this new segment. You can add in any additional information you want to import into AskNicely within that URL. You must add the "&" button to show a new field. Then "brand_name" is how I want to label it in AskNicely. Finally I use the available placeholder from Zendesk. There you have it! A semi-extensive look in how to use Triggers within AskNicely and Zendesk!